Citation: O’Dell FJ, Williams AN. Dr. Isaac Henry Gosset:Northampton’s first Consultant Paediatrician and Inventor of The ‘Gosset’ Icterometer.Pediatr Health Care Med 2017 2017;1(1):10-15. Dr. Isaac Henry ‘Harry’ Gosset (1907-1965), was the first paediatrician for Northampton General Hospital, being appointed consultant in 1947 . He was the son of William Sealy Gosset, a noted statistician, who wrote under the pseudonym ‘Student’, and developed the ‘t-test’, also known as t-distribution, and Margaret the daughter of James Surtees Phillpotts the Bedford School headmaster . Isaac Henry was born on the 18th February and baptised in the parish church of St. Bartholomew, Brightwell Baldwin in Oxfordshire, on the 19th May 1907. William was the eldest son of Frederic Gosset, a colonel in the Royal Engineers, and descended from an old French Huguenot family. William was academically talented winning a scholarship to Winchester and later a further scholarship to New College, Oxford to study mathematics, where he gained a first in 1897. Then two years later, a further degree in Natural Science (Chemistry), again a first. He found employment as a statistical analyst with the Irish brewing company Arthur Guinness based in Dublin . Isaac followed a similar educational route. He was educated at the Dragon School at Oxford, winning mathematics prizes, which would no doubt have pleased his father, this was followed by an entrance exhibition to Rugby School to read Classics, then going up to Magdalen College, Oxford, entering with a Demyship in Natural Science. This culminated in the award of a BA, second class honours in Natural Science (Physiology) in 1929 [4,5]. Whilst at Magdelan College Isaac corresponded, and visited, Joseph Kisser of the Institute of Plant Physiology at the University of Vienna, giving him a special tool for holding razor blades which Kisser liked to use for botanical work . Following Oxford Isaac Gosset went to St. Thomas’s Hospital as a Hector Mackenzie Exhibitioner qualifying in 1933. After qualification, and for the next fifteen months, Dr. Gosset undertook several roles. He held Clinical Assistant posts in various departments at St. Thomas’s, including childrens, gynaecological, X-ray, skin, and tuberculosis, followed by six months as Casualty Officer and Resident Anaesthetist and then, for a further six months, becoming House Physician (HP) at the Medical Unit there [5,7]. From St. Thomas’s Dr. Gosset went to be Casualty Officer at the British Postgraduate Medical School at the Hammersmith Hospital, and was in fact the first holder of this post at that hospital . After that he became a Senior House Physician at the Radcliffe Infirmary in Oxford . During his time at this hospital he was in charge of most of the children’s beds . He then spent nine months travelling the world with his sister Bertha, and visiting the Antipodes, travelling by van in Australia and in particular New Zealand where they had a number of relatives whom they visited [4,5,7,8]. Following this extensive tour he returned to St. Thomas’s for postgraduate study obtaining his MRCP in 1936. For the next fifteen months Dr. Gosset worked as an assistant to his uncle, Dr. ACV Gosset in General Practice (GP) at Liphook in Hampshire . Working with his uncle also gave him valuable experience of the medical care of children, “The practice included the medical care of Highfield Preparatory School for boys, and the running of an Infant Welfare Clinic in the village” . However he found from this experience that he had no liking for General Practice work at this time, so he left Liphook in order to specialise in diseases of children. Dr. Gosset then worked for a three month period at the London Chest Hospital as Assistant Tuberculosis Officer for Bethnal Green and South Hackney . Then, towards the end of 1939, secured a post for a year as “Assistant Medical Officer in charge of all children’s beds at West Middlesex Hospital, Isleworth, 1939-40” . He was the first doctor to hold this post at the hospital looking after all 120 beds singlehandedly . This appointment would have been for four years but the Second World War intervened and he resigned after a year to volunteer for the RAF . In 1940 Dr. Isaac Gosset volunteered for service in the RAF, receiving his commission with the rank of Flight Lieutenant on 29th August that year . Shortly after this he became a Medical Specialist serving in at least two RAF hospitals, and eventually rose to the rank of Wing Commander . Dr. Gosset said this of his experience at this time, “I was especially lucky in being a medical specialist, in working in R.A.F. hospitals all the time, and in being in full charge of the medical wards of those hospitals. I also conducted regular Out Patient clinics, to which airmen from the surrounding districts were referred by their unit medical officers for specialist opinions. My experience was therefore comparable to that of a consulting physician in civil life” . In 1942 Isaac Gosset married Eve Clarke, daughter of Henry Clarke, a GP in Salisbury, and together they went on to have four children, two sons and two daughters . The post with the greatest responsibility Dr. Gosset held during this time was as Senior Medical Specialist and Wing Commander “…in charge of the Medical Division at one of the largest R.A.F. General Hospitals” . This was at RAF Cosford, where he had special responsibility for repatriated RAF POWs to the United Kingdom (UK) . He also worked closely with the RAF Mass Radiography Units where all returning RAF personnel had chest X-rays taken and Dr. Gosset’s duty was “to investigate and elucidate any abnormalities that were discovered” . His last day of RAF service was 25th January 1946. After demobilisation he entered a six month post as Registrar to Dr. Schlesinger at the Hospital for Sick Children, Great Ormond Street, following this he returned for another six months to the West Middlesex Hospital as Registrar for Paediatrics and was one of five doctors doing what he had previously done on his own before the war . On the 5th May 1947 he wrote to the Superintendent of Northampton General Hospital applying for the post of consultant paediatrician . In this application he was the successful candidate. In October 1947 Dr. Gosset was appointed Consultant Paediatrician to Northampton General Hospital, the first such appointment in paediatrics and child health in this district. Indeed at the time of this appointment there was only one other paediatrician in the whole of the area administered by the Oxford Regional Hospital Board, this being Dr. Victoria Smallpeice . At that time Dr. Gosset was also consultant paediatrician to the other hospitals in the northern part of the Oxford region [4,8] (Figure 1). Figure 1: Dr. Issac Henry Gosset. In 1947 Dr. Gosset was elected Fellow of the Royal Society of Medicine, and regularly attended meetings of their paediatric section, and in the mid-1950s served four years (1953-1956) as a Member of the Council of that section, being elected on the 27th March 1953 . At the commencement of the National Health Service (NHS) in 1948 Dr. Gosset’s remit was extended to include provision of paediatric services to Kettering General Hospital, and from January 1949 the Harborough Road Infectious Diseases Hospital in Northampton, which included adults as well as children and took patients from a very large catchment area which included all of Northamptonshire, north Buckinghamshire, north Bedfordshire, as well as the Borough of Bedford and parts of Warwickshire . Dr. Gosset built up the small paediatric department to provide an outstanding paediatric service and was a pioneer in the development of exchange transfusions [4,8]. It was in October 1948, “with the full cooperation of the Obstetric Dept, [that the] Paediatric Department performed its first exchange transfusion for haemolytic disease of the newborn putting Northampton well ahead of most provincial hospitals in this respect” . Furthermore this procedure was not “established and more or less universally accepted” until the mid to late 1950s . Dr. Gosset’s daughter relates an account of her father’s working methods saying, “he spent many nights doing exchange transfusions. I remember watching him teaching a registrar how to do the procedure.” And she added that, on occasion, even her “…mother was on call to donate Rhesus negative blood…” . The term ‘perinatal’ came about in 1957, and in a personal letter to one of us (ANW) Professor Peter Dunn relates the origin of the term. “I coined the term in 1957, some 3 years before Alex Schaffer of Baltimore introduced neonatal medicine in 1960 and 13 years before Clem Smith gave a lecture entitled ‘Neonatal medicine today, perinatal medicine tomorrow’ . The mortality and care of these small perinatal patients during the period 1950 to the early 1960s was marked by nearly half of all deaths in childhood occurring within three days of birth . This is very different to the situation as it is today. The definition of prematurity was different too – defined by birthweight and not, as currently, gestational age, this being 2500 gm or 51/2 pounds or less [15,16]. This was a time before the commencement of specific neonatal intensive care units; as Peter Dunn indicated when talking about the circumstances found in the UK regarding treatment of newborn infants when he stated “... eventually in 1966, mechanical ventilation became available” . Following the introduction of mechanical ventilation treatment started to improve on this group of patients, particularly so during the work of Dr. Herbert Barrie on respiratory support . As this paper will relate Dr. Gosset was indeed ahead of his time. Even as late as the 1970s the contemporary opinion still saw premature baby units as being in close proximity to teaching centres . This view was supported by Court and Jackson in 1972. In their book ‘Paediatrics in the Seventies’ they had said that the speciality of perinatal paediatrics “is unlikely to be found outside the university hospitals” . It seems there were simultaneous developments in neonatology on both sides of the Atlantic in the early days, with little contact between the leading authorities in the speciality, Mary Crosse in England and Julius Hess in America. Mary Crosse mentions Hess only once in her book and rarely in her published journal articles, while Julius Hess does not mention Crosse at all . It seems from later developments in the UK that one followed either Mary Crosse or Julius Hess. The first premature baby unit in the UK was at the Sorrento Maternity Hospital in Birmingham, set up by Dr. V Mary Crosse in 1931, she was later seen as an expert in her field especially following the publication of her book. This book, ‘The Premature Baby’, was published in 1945 and went on to be a seminal publication in the area of premature baby care published over many editions until the final eighth edition in 1975 [21,22]. The second premature baby unit in England was established by Dr. Beryl Corner at the Southmead Hospital in Bristol in 1946, guided by the experiences of Dr. Julius Hess . During the 1950s many of the teaching centres set up premature baby units . Hospitals such as University College and the Hammersmith in London, Alder Hey in Liverpool, Birmingham Children’s, and also hospitals in Newcastle and Sheffield among others. The Court Report lists the cot/bed numbers which showed a steady increase so that by 1964 they totalled 2,120 in England and rose to 3,978 by 1975 . For Northampton the first premature baby unit predated 1950 and was situated on the ground floor of the Barratt Maternity Home. The maternity home was built following a generous donation from William Barratt, a noted Northampton shoe manufacturer . Although this premature baby unit, which apparently consisted of twelve cots, could not have been very large as it later became the senior midwife’s office [25,26]. In 1950, led by Dr. Gosset, who helped with the planning, a premature baby unit was formed on the first floor of the Barratt Maternity Home, using the area previously occupied by the labour ward, which admitted babies from across the County of Northamptonshire [5,27]. This, as described by Phyllis Henbest, sister in charge of the premature baby unit, in an unpublished memoir, “consisted of three rooms, two with terrazzo floors had been labour wards, one with a wooden floor had been a first stage ward – these rooms could accommodate about six cots each.” There was also a smaller room, together with a shared milk kitchen; this unit could therefore hold about twenty baby cots . Dr. Gosset was also involved with the polio epidemic which afflicted the country in the 1950s; the following passage is extracted from his CV. “The polio epidemic of the early 1950s struck Northampton sooner (and initially harder) than the rest of the Oxford Region. It was realised early in 1950 that existing facilities would have to be expanded rapidly, and provision made for additional respirators and for training personnel to look after them – an entirely new field in those days for a paediatric unit – but all this was achieved quietly and without publicity, so that very few people outside the hospital service were aware of the seriousness of the epidemic which occurred here in that year” . The Northampton County Borough Health Report 1951 indicates that reported acute poliomyelitis figures from 1912 to 1947 did not go above eight cases in any year. However for the year 1950 the numbers doubled to sixteen, and in 1951 rose to twenty-three, equal to an ‘attack rate’ of 0.22, the figure for England and Wales was just 0.05. The Health Report stated, “... consequently 1951, with 23 cases and 3 deaths, may be regarded as the worst year locally” . On the 24th April 1953 Dr. Gosset received information from the Minister of Health via correspondence from the Oxford Regional Hospital Board to say that he had been granted a ‘C Class Distinction award’ as a paediatrician. This gave him an additional £500 per annum and furthermore it was backdated to April 1951 . He also researched over many years dominant laterality, making “many hundreds of studies on large groups of children until he had satisfied himself that the whole concept of crossed laterality was founded on fallacy.” Dr. Gosset never published his findings in full, however they were presented in two lectures [2,8] His working title for this research publication was ‘Cerebral Dominance in Children, with particular reference to Reading Difficulties’ . There exists an inventory list of Dr. Gosset’s research material, which was substantial, and included colour photographic slides, cine film, sound tape recordings, diagrams and prints. A selection from the list shows the extent of his work in this field; 6 boxes of medical slides and notes, 3 boxes of notes relating to laterality lectures, a tape recording of a laterality lecture, 8 short 8 mm cine films, and 1 box of 8 mm cine films . It is not known how large the boxes were that contained all of this material. What is known is that all of Dr. Gosset’s research material on laterality was given over by his wife to an unknown London doctor after her husband’s death . Dr. Gosset also wrote a paper on congenital abnormalities which appeared in the 1956 edition of ‘The Northampton General Hospital Nurses’ League’ Journal, which summarised foetal development as it was known at that time . In this article he wrote about heredity, mutations, environmental factors, normal foetal development, abnormal foetal development, factors influencing development, maternal infections, prevention, and ended with a conclusion; this was, in essence, a lecture for nurses delivered in a paper. A meeting of the Oxford Regional Paediatricians was held at Northampton General Hospital on the 12th October 1957. At this meeting Dr. RB Coles, consultant dermatologist at Northampton, read a paper which he had written entitled ‘Observations on a 12-months’ survey of staphylococcal sepsis in a maternity home’. From March 1956 there was an increase in the numbers of cases of staphylococcal sepsis in Northampton’s maternity home and Dr. Gosset approached Dr. Coles “stimulating [him] into thinking about this problem” . This outbreak was subsequently resolved and one outcome was the introduction of an ‘ascertainment routine’ that is the discovery and recording of cases of infection. This was a couple of years before the report on staphylococcal infections in hospitals was published which recommended implementing such an ascertainment routine . This shows that yet again Northampton General Hospital was ahead of the national picture. Following on from his work on exchange transfusions Dr. Gosset conjectured that testing for bilirubin without inflicting a blood test for jaundice on newborn babies would be preferable to heel pricks. In 1954 he “devised a scale to estimate bilirubin levels using painted lines of various hues of yellow on plastic strips which became known as an icterometer” . Dr. Gosset trialled and used his icterometer throughout the middle to late 1950s, initially making them himself by hand, and latterly manufactured by a firm called Ingram in Birmingham. The manufacturing process was standardised according to Dr. Gosset’s instructions as detailed in his Lancet paper . However the Ingram records from this time have been lost so it is not possible to ascertain how financially viable the icterometer was. He additionally corresponded with doctors in Birmingham who were also looking into the efficacy of the icterometer. One of these Birmingham doctors was Dr. Ben Wood of the Children’s Hospital (King Edward VII Memorial) who had discussed the icterometer with Dr. Mary Crosse at the Sorrento Maternity Hospital, also in Birmingham. Dr. Crosse wrote to Dr. Gosset to see if he could lend her one of his icterometer scales commenting, “If you could I should be delighted because we are so tired of pricking 2 pounders daily” . Dr. Gosset actually gave her two icterometers about which he commented, “If you find the scale as useful as we do I hope that you will let me know...” . Mary Crosse replied, “Thank you so much for sending me two of your visual scales. I will certainly let you know our results” . In fact these two Gosset Icterometers were used extensively at the Sorrento Maternity Hospital, so much so that Dr. Jean Shackleton, Dr. Crosse’s registrar, wrote to Dr. Gosset asking about a replacement because the paint was wearing off, she states, “During the frequent use several stripes are either faded or almost non-existant.”, she went on to say, “We certainly found the scale useful” . Therefore in both Northampton and Birmingham there were independent investigations into the feasibility of wider use of Dr. Gosset’s Icterometer [40,41]. Both studies validated the use of this instrument and were published simultaneously in the same issue of the Lancet in 1960, and can be considered to be “...amongst the earliest papers on an intervention within neonatal care” . 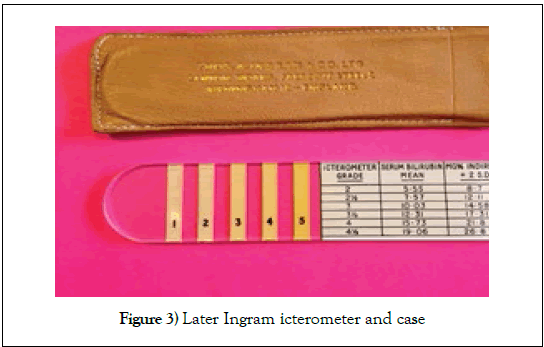 In 1962 Dr. Ben Wood co-authored two papers on neonatal jaundice both citing the Gosset icterometer but not referencing or acknowledging Dr. Gosset, these give the impression that medical colleagues would be familiar with the device [42,43] (Figure 2 and 3). In a letter to Dr. Gosset in 1959, Dr. RB Miller, working at All Saints’ Hospital in Chatham, Kent, commented about the icterometer that he was “impressed by it’s accuracy and usefulness” . Other doctors have also found the ‘Gosset Icterometer’ to be extremely useful. Amongst the Gosset Family Papers there exist numerous correspondences from clinical and other medical staff. Just three will suffice to illustrate this point; Dr. Fisher from St Bartholomew’s Hospital in Rochester, Dr. Bower from the Children’s Hospital in Birmingham, and Mr Ruthven, a biochemist from Queen Charlotte’s Maternity Hospital in London. Dr. OD Fisher commented that the icterometer is “…most effective and satisfactory. It has saved the laboratory a considerable amount of work…” . Dr. B Bower reiterated this view by saying “Having now become more practised in its use, I am finding it very valuable in routine neonatal work…”  Mr CRJ Ruthven said “We expect that the icterometer will prove particularly popular in the smaller hospital without adequate pathological facilities” . In addition to these other doctors, there were letters and business cards worldwide asking for information about the icterometer, and requests for reprints of Dr. Gosset’s Lancet article. The following list gives a flavour of these requests; Czech Republic, Hungary, Cuba, France, Denmark, Canada, Australia, Germany, Spain, Austria, and Belgium. There were also requests from the United States of America, for example Washington, Monterey, New York, and Cincinnati among many others. In 1994, forty years after Isaac Gosset conceived his idea, a study was carried out to evaluate his icterometer against electronic bilirubin meters. This study concluded that the “…icterometer provides reliable, cost-effective screening for clinically important hyperbilirubinemia in premature babies…[and that this] simple device performs as well as electronic bilirubin meters…” . However in 2010 the National Institute for Health and Care Excellence (NICE) issued a recommendation that stated, “Do not use an icterometer to measure bilirubin levels in babies.” effectively cutting off icterometer use in the UK . However, even in the 21st Century, use of the ‘Gosset’ icterometer does in fact still continue in various countries around the world . In 1958 Dr. Isaac Gosset became a member of the British Paediatric Association after his election as an Ordinary Member at the 29th Annual General Meeting of that association . Also at some point following that date he became Chairman of the Paediatric Sub-committee of the Oxford Regional Hospitals Board . In 1961 he was elected FRCP, Fellow of the Royal College of Physicians . It was becoming apparent that the existing facilities of the premature baby unit at Northampton General Hospital’s Barratt Maternity Home were inadequate and a decision was taken to build a new unit. A planning team was established comprising of the consultant paediatrician (Dr. Gosset), consultant obstetrician (Mr Alment), Matron of the maternity home (Miss Hague), Sister in charge of the PBU (Miss Henbest) and the architect (Mr Goodlad). This team visited premature baby units in Birmingham, Bristol and in Exeter, which had the newest unit in England . The new unit was constructed on the top of the gynaecology department and completed at a cost of £40,000; £35,000 for the building, and much new equipment costing £5,000. The local newspaper said “Now the Barratt can boast one of the largest and best equipped premature baby units in the country” . This new unit could accommodate thirty-six cots (the old one, twenty-four) and was four times as big as the one it replaced. The newspaper went on to describe the new unit, “In the main part of the unit there are six single cubicles for babies requiring extra-special care, three double cubicles, three for four babies, one for five and two for six. The cubicles have been built around a central glass sided office from which [the staff] can keep an eye on all the 36 babies” . This new unit was also equipped from the start with accommodation bedrooms for two mothers . Dr. Peter Dunn commented in a lecture he gave in 1997 that, “new approaches to newborn care were introduced in the 1970s. One was an appreciation of the importance of involving the whole family in the exciting events around childbirth, however ill the baby might be, and of also involving the mother in her infant’s care” . So, as we have seen above, Northampton was again at the forefront, and ahead by at least five years, of what became the established practice of involving the mother in her babies care. However this established practice, called ‘Family Integrated Care’ by Berrington and Ward Platt in 2016, which is now normal in paediatrics, is not, by comparison, widespread in neonatal care, which they say “...has fallen far behind” . This provides further evidence in support of Northampton’s leading the field with not all provincial hospitals lagging behind the major teaching centres. In terms of the care the new unit was able give to its tiny patients Sister Henbest commented, “We followed the precepts of Dr. Mary Crosse of Birmingham, the leading authority on the care of the premature baby at that time” . This contrasts with Dr. Beryl Corner at Southmead Hospital in Bristol who followed Dr. Julius Hess in this regard,  thus supporting the earlier statement about both sides of the Atlantic in the perinatal care section above. As stated previously the cot/bed numbers in 1975 totalled 3,978 these were spread over 254 hospitals; the Special Care Baby Unit at Northampton was among the larger units (having more than 24 beds) with only two other units of comparable size in the Oxford Regional Hospitals Board area . Dr. Gosset had planned to attend the 11th International Congress of Paediatrics in Tokyo, Japan, in November 1965, and had written to the British Paediatric Association at the Institute of Child Health in Great Ormond Street for further information on the congress. They had replied on the 10th March 1965, but without much extra information, however the letter did include additional itinerary information about three different flight options; option 1, flight, conference, and accommodation only; option 2, as option 1 but with a tour; option 3, as option 2 but with an extra tour, (this also included prices for the three options). The same letter also informed Dr. Gosset that there were eight colleagues from Great Ormond Street Hospital who were also planning to attend . Dr. Gosset never got to read this letter. Dr. Isaac Henry Gosset died on the 4th March 1965. He had attended his regular Thursday clinic at Kettering General Hospital, on completion of the clinic he went to his car and began his drive home. He was found a little later in a collapsed condition, his car parked off the road with the engine switched off. He was subsequently taken to Kettering General Hospital but was found to be dead on arrival . In the BMJ Obituary his friend ‘C. O.’ wrote, “The end is characteristic of the man…at the last, he was neat, modest, and thoughtful for others” . Mr Stanley Hill, the secretary of the Northampton and District Hospitals Management Committee, said on the day following Dr. Gosset’s death, “We are all profoundly shocked by the sudden death of our colleague, Dr. Gosset. He was a most agreeable and amiable colleague, and his wit and his intelligent counsel and personal charm will be sadly missed, as well as his high standard of clinical ability” . The funeral service for Dr. Gosset was held at All Saints Church in the centre of Northampton on the 9th March, his family had requested no flowers but donations could be made to Save the Children Fund . The new special care baby unit opened at the end of March 1965, just three weeks after Dr. Gosset’s death. Such was the “…veneration in which Dr. Gosset was held [by hospital staff]…was illustrated by the spontaneous suggestion which arose from them that the new Premature Baby Unit at Northampton General Hospital should be called “Gosset Ward” as a tribute to his memory, and the Management Committee immediately acceded to this request” . The Gosset Ward still honours his work, is a neonatal intensive care unit, part of the Central Newborn Network, and carries a level two designation  (Figure 4). On Friday 11th December a short ceremony, together with the unveiling of a memorial, took place at the Dr. Gosset Commemoration 2015 held at the unit that bears his name. This paper demonstrates the national, and indeed international, importance of Dr. Gosset’s work. It deals with several topics where Dr. Gosset led Northampton General Hospital’s practice in a forward thinking and innovative way, where they were ahead of the times, with items discussed that later became standard practice. 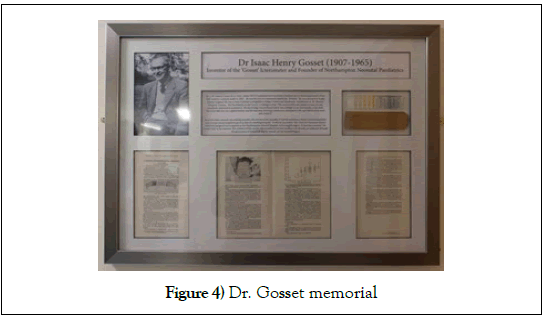 The large number of enquiries Gosset received from many doctors around the world is testament to the importance of both his Lancet paper and the developments and global use of his icterometer. Future 20th Century medical historians will lament that there is very little surviving United Kingdom archival material relating to the development of premature baby units and general paediatrics from the end of the Second World War to the mid 1960s. 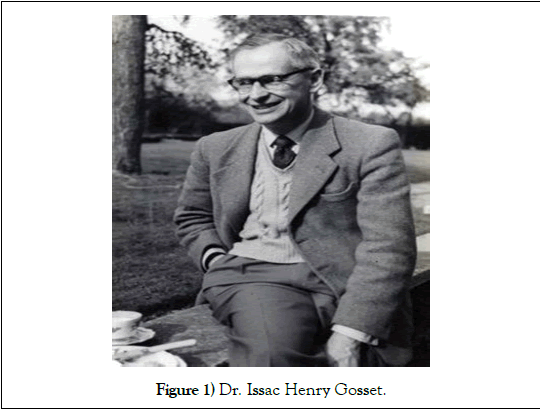 The ‘Gosset Collection’ is an online repository of the life and work of Dr. Isaac Henry ‘Harry’ Gosset, consultant paediatrician Northampton General Hospital, illustrating exemplary general paediatric and premature baby care (1947-1965). Within it, you can take the healthcare journey of the newborn child or paediatric case of that time. Established as part of a commemoration of the 50th anniversary of Dr. Gosset’s untimely death, the ‘Gosset Collection’ has complete premature baby and general paediatric care protocols, together with original film taken by Dr. Gosset of the Premature Baby Unit as well as the general paediatric ward. There is also a section on the development of the ‘Gosset Icterometer’, which Dr. Gosset invented, developed, and introduced into perinatal practice from the 1950s and in use until the 1970s, and beyond. Made of Perspex the icterometer could rapidly and accurately identify neonatal jaundice, saving unnecessary blood tests and focusing attention on the sicker jaundiced newborn. The ‘Gosset Collection’ also contains the 1960 Lancet paper of a successful trial of the icterometer (through permission of Elsevier) an important landmark in neonatal medicine. Lastly, there is a short vodcast placing Dr. Gosset’s pioneering work in premature baby care within the context of the early development of this subspeciality . We offer thanks to the members of Dr. Gosset’s family who kindly granted us access to their family papers for this publication. After 60 or more years it has not been possible to identify the patient in Image 2. Waddy FF. A history of northampton general hospital 1743-1948. Northampton: Guildhall Press, 1974. Vyas SA, Desai SP. The professor and the student, Sir Ronald Aylmer Fisher (1890-1962) and William Sealy Gosset (1876-1937):Careers of two giants in mathematical statistics. Journal of Medical Biography 2015;23:98-107. Gosset Family Papers. Gosset C.V. 1961. Gosset Family Papers. Correspondence. Letter from Dr. J Kisser to Gosset, 7th Jan 1927. Gosset Family Papers. Correspondence. Application for consultant post, from Gosset to Northampton General Hospital Superintendent, 5th May 1947. Gosset Family Papers. Correspondence. Letter from the air ministry to Gosset, 29th August 1940. Gosset Family Papers. Correspondence. Reference letter from Air Vice Marshall J Conybeare to Gosset, 7th December 1945. Anonymous. Exchange transfusion. Acta Paediatrica 1963;52:21-24. Personal communication from Dr. Janet steer to Dr. Andrew N Williams, 10th December 2014. Personal communication from Professor Peter Dunn to Andrew N Williams, 1st May 2015. Dunn PM, MacGregor ME. Infant and child mortality in South Warwickshire, 1962-1963. Archives of Disease in Childhood 1964;39:492-495. Crosse VM. Is the premature baby worth saving? American Journal of Public Health 1954;44:1010-1014. Crosse VM. The premature baby. British Journal of Obstetrics and Gynaecology 1946;53:72-83. Dunn PM. The development of newborn care in the UK since 1930. Journal of Perinatology 1998;18:471-476. Court D, Jackson A. Paediatrics in the seventies: Developing the child health services. British Paediatric Association. London: Oxford University Press, 1972. Personal communication from Julia Gardner of Chicago to Andrew N Williams, 29th November 2016. Crosse VM. The premature baby. (1st edn) London:J and A Churchill Ltd, 1945. Crosse VM. The preterm baby and other babies with low birth weight. (8th ed) Edinburgh:Churchill Livingstone, 1975. Southmead General Hospitalgroup Management Committee. The care of the premature baby in the Bristol area. Bristol:Southmead Hospital, 1952. Christie DA, Tansey EM. Origins of neonatal intensive care. Welcome witnesses to twentieth century medicine. London: Welcome Trust Centre for the History of Medicine at University College London, 2001. Henbest P. Unpublished memoir, 1984. Northampton General Hospital archive collection. Gosset IH. Gosset family papers. Information specification memo for new consultant applications, 28th August 1953. Williams AN, O’Dell F. Dr. Isaac Henry Gosset (1907-1965) inventor of the ‘Gosset’ icterometer and founder of Northamptonshire paediatrics. Archives of Disease in Childhood Fetal and Neonatal Edition, 2016;101:264-265. Northamptonshire Medical Officer of Health. Northampton County Borough Health Report. Northamptonshire County Council, 1951. Gosset Family Papers. Correspondence. ‘C class’ award letter from Ledger to Gosset, 24th April 1953. Gosset family papers, inventory list of laterality material, undated. Personal correspondence from Dr. Janet steer to Dr. Andrew N W, 31st October 2016. Gosset IH. Congenital abnormalities. Northampton General Hospital Nurses League Journal 1956;11-23. Coles RB. Observations on a 12-months’ survey of staphylococcal sepsis in a maternity home. Public Health 1959;285-291. Ministery of Health. Central Health Services Council, (1959) Staphylococcal infections in hospitals. London:HMSO, 1959. Williams AN, O’Dell FJ, Dunn PM. The ‘Gosset’ icterometer: A brief history. West of England Medical Journal 2016;115:1-4. Gosset Family Papers. Correspondence. Letter from Dr. Mary Crosse to Gosset, 7th January 1959. Gosset Family Papers. Correspondence. Letter from Gosset to Dr. Mary Crosse, 10th January 1959. Gosset Family Papers. Correspondence. Letter from Dr. Mary Crosse to Gosset, 19th January 1959. Gosset Family Papers. Correspondence. Letter from Dr. Jean Shackleton to Gosset, 18 September 1959. Gosset IH. 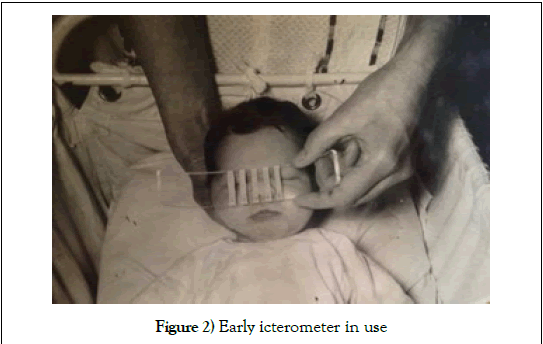 A Perspex icterometer for neonates. Lancet 1960;275:87-88. Culley PE, Waterhouse JAH, Wood BS. Clinical assessment of depth of jaundice in newborn infants. Lancet 1960;275:88-89. Waterhouse JAH, Powell DJ, Culley PE, et al. A comparison of the incidence of jaundice between two premature baby units. Proceedings of the Royal Society of Medicine 1962;55:985-988. Wood BSB, Culley PE, Waterhouse JAH, et al. Factors influencing neonatal jaundice. Archives of Disease in Childhood 1962;37:371-377. Gosset family papers. Correspondence. Letter from Dr. R Miller to Gosset, 27 September 1959. Gosset family papers. Correspondence. Letter from Dr. O Fisher to Gosset, 15 March 1960. Gosset family papers. Correspondence. Letter from Dr. Brian Bower to Gosset, 3 May 1960. Gosset family papers. Correspondence. Letter from Mr C Ruthven to Gosset, 23 May 1961. Merritt KA, Coulter DM. Application of the Gosset icterometer to screen for clinically significant hyperbilirubinemia in premature infants. Journal of Perinatology 1994;14:58-65. NICE Jaundice in newborn babies under 28 days. NICE Clinical Guideline 98. National Institute for Health and Care Excellence, 2010. British Paediatric Association. Proceedings of the twenty-ninth annual general meeting. Archives of Disease in Childhood 1958;33:381-383. Anonymous. Barratt new premature baby unit will be one of best in the country. Northampton Chronicle and Echo newspaper, 26th February 1965. Berrington J, Ward PM. Recent advances in the management of infants born <1000g. Archives of Disease in Childhood 2016;101:1053-1056. Gosset family papers. Correspondence. Letter from BPA (Paediatric Congress) to Gosset, 10th March 1965. Anonymous. Doctor dies after collapse in car. Northampton Chronicle and Echo newspaper, 5th March 1965. Anonymous. Family Notices. Northampton Chronicle and Echo newspaper, 6th March 1965. Northampton and District Hospital Management Committee. Northampton and District Hospital Management Committee Report for the year 1st April 1964 –3rd March 1965.